Ah Vetivresse, another delightful foray into gentler places and times. Oscar diuinus, indeed! I also suspect that his scents were masculine, not at all like those fussy eaux that Waugh's Brideshead clique certainly wore at Oxford a generation later. Oscar was a man, for all that. Merci, M., Would love to know where else his scent preferences led him. I imagine a small perfume bottle of mercury blue glass labeled "Bosie," hidden among the suitcases in the Hôtel de Paris. 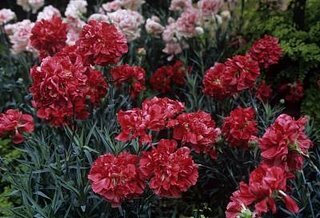 I like my carnation hot spicy,lush and full. i like Garofano and even Bellogia well enough, but would like to smell something just a bit drier, not so sweet. Do you know of anything like that? And I agree: different that E.Waugh. I do love Garofano as well. They are trully gorgeous carnations each in its own capacity. Veronica, have you tried the Prada No 2 Oeillet? I don't know if it's as full as the Garofano but it is dry with very elegant powder and spice. Helg, Zut! I hope Oscar did his morning "Asperges Me" with it. What would Waugh have worn? He did like his pipe and cigar/ettes. Now, Anthony Blanche: Shalimar? Black Narcissus? E., I love it! Yes, he'd pick up some Sarrasins with a darling little Cuir Mauresque to idle away the hours with. Thanks for a suggestion, I'll put it on my list! I find Malmaison to be a puff of pure delight, all powdery-peppery with the tinge of bitterness of cloves. I first tried it in the dead of winter at the Old England department store in Paris, where all the chic, bourgeois, anglophile Parisians shop -- and there's nothing quite so Anglophile as the old Parisian bourgeoisie, except the French aristocracy. It is indeed a scent for male and female dandies, not overly complex but with quite a lot of panache.